Curious About Smart Home Technology? Seeing is Believing! Often when you’re interested in a product or technology, you turn to the internet. You Google a product to see reviews, look up technical specifications, and read articles about features and tests. However, when it comes to smart home automation, it can be hard to take abstract specs and turn them into a complete understanding of the everyday solutions that smart tech offers. Why? Because a true smart home automation experience is not about specs and features. It is about finding solutions to make your life simpler. So, if you’re considering adding something to your home, you may find it difficult to evaluate what automation technology can really do for you and which options will fit your needs and lifestyle. Our partner Control4 strongly believes that the customer should be able to see and feel what smart home technology is all about. To that end, they created the Control4 Certified Showroom program. We are excited to participate in the program and have built a showroom right here in Vancouver, WA to let you experience the latest smart tech for yourself. Visit our Control4 Certified Showroom to see, hear, and touch smart home automation for yourself. Let us know you’re interested in the chat box at the bottom of your screen and one of our Certified Showroom Professionals will respond. When you visit our showroom, you’ll get to see and use the smart technology in action. Control4 takes the different elements of smart home automation—lighting, entertainment, climate control, networking, and security—and blends them together seamlessly to create the effortless environment you want in your home. One area people often start with in home technology is entertainment. Piecemeal audio and video systems can get complicated with multiple devices to turn on, inputs to set, and content sources to select. Everyone wants the “one remote” solution with one or two buttons that makes it all work, and that’s exactly the one-stop solution that Control4 offers. And at a Control4 Certified Showroom, you can see and try that remote for yourself. But there is so much more than just entertainment automation to smart home technology. For example, lighting control and smart thermostats can work together for comfort and energy savings. When you’re ready to head to bed, a “goodnight” scene can turn off your home’s lights, ensure that any audio and video entertainment systems are off, leave some strategically dimmed lights on, and set the thermostat to a comfortable sleeping temperature. In our Certified Showroom, we can show you just how that works. Another benefit to a Control4 system over other piecemeal products is how it all works seamlessly as a whole. Individual companies will allow you to buy certain smart home products, but each company comes with its own app and controls—leaving you with a slew of apps to open and close for basic home control. With Control4, however, there isn’t several different apps to control entertainment, climate, lighting, shades, and security. It is all part of one system and one app. You can also add on different smart home tech as you go to the same app and system—letting you start small and expand at your leisure. You can begin with entertainment automation and then add lighting control, security, and more as your needs and budget allow. The more you add, the more you’ll see how it can all work together to accommodate your lifestyle. 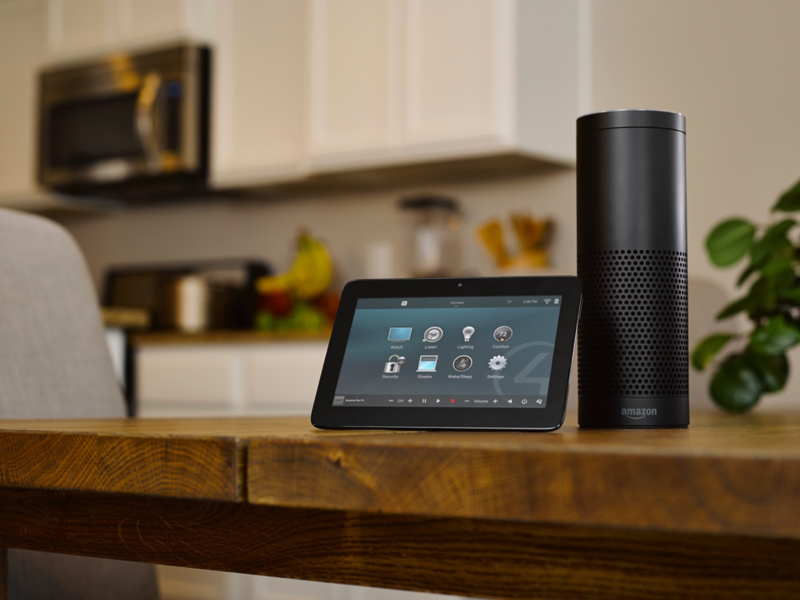 And yes, we can show you how Alexa adds hands-free voice control to a Control4 system, too. When you come into a Control4 Certified Showroom, you’ll have us, your personal smart home guides, to walk you through all the amazing possibilities available with home automation. So, if you want to know your options for home theaters, how to integrate security cameras with lighting, how to monitor your home when you’re on vacation, or anything else smart home—we can show you how. Let us know you’re interested in visiting a Certified Showroom in the chat box at the bottom of your screen and one of our Certified Showroom Professionals will respond.